Please type your desired tags, e.g. Tumor Microenvironment, Mathematical Science, Psychological Sciences, Epigenetics, lncRNA biology, Software Engineering, Grant Writing, Romantic Relationships, Public and School Libraries, Public Adminstration, Creative Writing, US History, Rhetoric and Composition Theory, Poetry, Nineteenth and twentieth century feminist, and etc. By identifying the surface modification after various wet chemical processes (HF etching, acid/base cleaning and etching) for several types of semiconductors (groups IV, IV-IV, III-V), by characterizing the nature of H, Cl, OH and oxide passivation of semiconductor surfaces, and by uncovering the growth mechanism of high-k dielectrics on silicon and germanium. We are exploring the growth by Atomic Layer Deposition (ALD) of Al2O3, HfO2, La2O3 with sub nm equivalent oxide thickness (to replace SiO2), and of metal contacts (TaN, Cu, Ru) and investigating the best wet chemical cleaning methods for high mobility substrates (e.g., Ge, InP) to replace silicon in future CMOS devices. We are also studying elementary processes at the surface of SiC, an important substrate for high-temperature, high-speed and high-voltage electronics. By providing chemical information and badly needed fundamental understanding of III-V semiconductor surface passivation. After studying wet chemical etching and oxidation of InP, we are now exploring gaseous oxidation in controlled environments (e.g., UHV). By examining the manner in which hydrogen molecules interact and get incorporated into complex metal hydrides and metal organic framework (MOF) materials. In the case of metal hydrides, we study the dissociation and subsequent adsorption of H2 on Ti-doped aluminum surfaces to better understand and control the formation of complex metal hydrides (e.g., NaAlH4). For the MOF materials, we focus on the weak interactions between H2 molecules and the metal and organic ligands to design more effective ways of increasing the hydrogen concentration. By using biological approaches to patterning surfaces on the nm and sub-nm scale. For instance, the possibility to manipulate DNA scaffolding is used to meet tight nanolithography requirements of integrated nano-circuits. An important aspect of this work is the control of DNA bonding to semiconductor surfaces. To this end, we are working on the fundamentals of DNA/surface interactions. By understanding the interaction of biological macro-molecules (DNA, glucose, LDL, etc.) with both organic and inorganic substrates. For instance, by studying the modulation of the electric field and charge transfer mechanisms by biological molecules, we are devising ways to implement electronic detection of biological species. We are also studying the chemistry of graphite with aim to produce high-quality graphene (via graphene oxide) and to understand the oxidation of graphene using oxygen plasma, ozone and wet chemistry. 2009–2009	Y. J. Chabal, Joint AVS and Taiwan Annual Physical Society Meeting on Beyong Si CMOS, Tapei, Taiwan, Jan. 20-21, 2009. 2008–2008	Y. J. Chabal, Society of Professional Hispanic Engineers Professional Development Conference, Plano, TX, April 24, 2008. 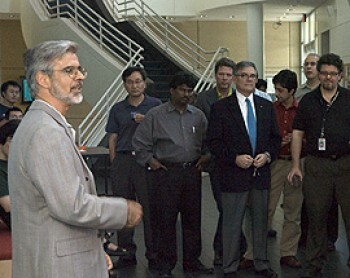 2009–2009	Nour Nijem, Jean-Francois Veyan, Yves J. Chabal, Kunhao Li, JeongYong Lee, Jing Li, Lingzhu Kong, Valentino R. Cooper, David C. Langreth, computational Materials Science Network on Predictive Modeling of the growth and properties of energy relevant thin films and nanostructures, Denver, CO, October 18-20, 2009. Granted: US 6,388,290 B1:Single Crystal Silicon on Polycrystalline Silicon Integrated Circuits Yves J. Chabal and George K. Celler. Granted: US 7,223,677 Process for fabricating a semiconductor device having an insulating layer formed over a Semiconductor Substrate Yves J. Chabal, Martin Frank and Glen Wilk. Filed: A Method for Semiconductor Device Fabrication in which an insulating Layer is formed over a Semiconductor Substrate Yves J. Chabal, Martin Frank, Marin L. Green and Glen Wilk. Researchers at UT Dallas and Rutgers University have received a $1 million grant from the U.S. Department of Energy to explore a key component in making hydrogen a widely used form of clean energy. Hydrogen could be a significant part of a clean-energy economy – powering motor vehicles in particular – but storage has been a stumbling block. Scientists are searching for a practical alternative to either compressed gas or chilled liquid hydrogen. The UT Dallas/Rutgers team is exploring a technology known as a metal organic frameworks. A technology breakthrough and an emerging company with close connections to UT Dallas have each been honored with one of the Metroplex Technology Business Council’s annual Tech Titan awards. Researcher Yves Chabal received the Tech Titan Tech Innovator award for work that promises to greatly improve semiconductor devices’ performance in health care and solar power applications. And MicroTransponder, a biotechnology firm sponsored by The Institute for Innovation and Entrepreneurship at UT Dallas, won the Tech Titan Emerging Company Award. Chabal’s work lays the groundwork for attaching virtually any organic molecule to silicon. In addition to enabling biosensors that detect minute quantities of substances such as cancer-marker proteins, the new technology promises a new generation of higher-efficiency solar cells that could incorporate sunlight-sensitive biomolecules, for example, that capture photons and transfer the energy to the electronic substrate. The American Physical Society has awarded a UT Dallas researcher one of the society’s highest honors, recognizing Dr. Yves Chabal’s development of methods to better understand processes that take place on the silicon surface that is literally the platform for the multibillion-dollar semiconductor industry. “Yves’s development of infrared spectroscopy in the 1980s to understand the processes that occur on silicon surfaces during semiconductor manufacturing changed how everyone in the semiconductor industry does their work,” said Bruce Gnade, vice president for research at UT Dallas. “His work has had tremendous impact. 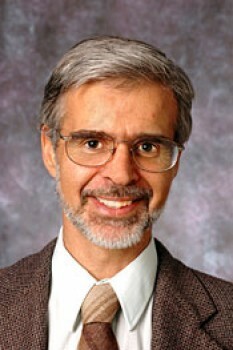 In the world of infrared spectroscopy of semiconductor surfaces,Yves is the world’s expert.” Dr. Chabal is head of the Materials Science and Engineering Department in the Erik Jonsson School of Engineering and Computer Science at UT Dallas and the first holder of the school’s Texas Instruments Distinguished University Chair in Nanoelectronics. A University of Texas at Dallas team will play a key role in a new $15 million research project designed to enable manufacturing at an almost unimaginably small scale: one atom at a time. “This breakthrough technology will make it possible to manufacture devices with atomic precision by exploiting our established ability to remove individual hydrogen atoms from a silicon surface using a scanning tunneling microscope,” said Robert Wallace, a professor of materials science and engineering in the Erik Jonsson School of Engineering and Computer Science at UT Dallas and a co-principal investigator in the project. Funded for $1.8 million over the next four-and-a-half years, the UT Dallas team also includes Yves Chabal, head of the Jonsson School’s new Materials Science and Engineering Department and holder of the Texas Instruments Distinguished University Chair in Nanoelectronics, and K.J. Cho, an associate professor of materials science and engineering and physics. 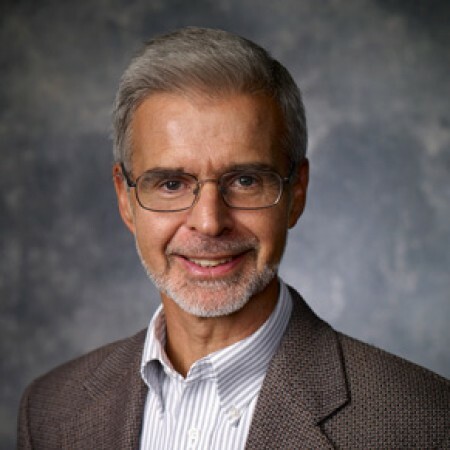 Dr. Yves Chabal, one of the world’s foremost authorities on semiconductor surfaces, semiconductor materials and the interfaces between them — areas that are central to developing future generations of microchips — is joining The University of Texas at Dallas, where he will be the first holder of the Texas Instruments Distinguished University Chair in Nanoelectronics. The $2 million chair was made possible by the Texas Nanoelectronics Research Superiority Initiative, which is a joint venture between the State of Texas Emerging Technology Fund, The University of Texas System, UT Dallas, UT Austin, UT Arlington and private industry, to make Texas a leader in nanoelectronics research.